The former Jerry's Sandwiches, soon to be Rhyme or Reason. WICKER PARK — Rhyme or Reason, a 1970s-inspired gastropub with live music, will soon replace the former Jerry's Sandwiches, co-owner LeQoinne Rice said. The venture, which will take over the shuttered Jerry's Sandwiches, 1938 W. Division St., just launched a website and announced on its Facebook page that it is hiring for front and back of house positions. Rice, who owns Rhyme or Reason with Zafer Genc, a real estate investor who was previously part of a group that ran Union Park Lounge in the West Loop, said that they are aiming to hire about 30 to 35 workers. And if everything goes as planned, Rhyme or Reason will open in mid-January, Rice said. 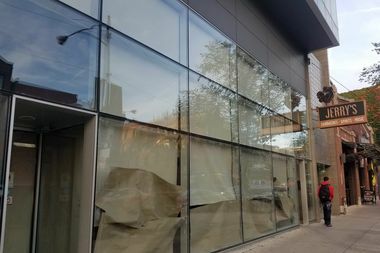 The 4,500-square-foot storefront, just east of Division Street and Damen Avenue along a busy stretch packed with bars, will have 174 seats and a stage. "We are looking for that hungry artist and artists that have proven themselves and who are looking to prove themselves," Rice said. In addition to live music, Rhyme or Reason will have a DJ booth that will spin vinyl during happy hour, mostly disco, funk and soul, Rice said. Rice said the name of the bar draws from the fact that when a person tries to juxtapose two different things, such as '70s vintage decor with modern music and food, it could seem like there is no "rhyme or reason" to it, as the idiom goes. Chef Chris De la Cueva, who previously worked at Ogden Sports Bar near the United Center, will prepare the cuisine, Rice said. A menu is being devised now but it is not finalized. Genc previously said that an expansion on bar food — more than just wings and burgers — will be the goal, augmented by cocktails and beer. 'We are absolutely excited; it will be great for the neighborhood. It will be diverse in terms of what we have on the street. The majority are bars and sports bars," Rice said. To get an idea of what the vibe could be like, check out a few of Rhyme or Reason's Instagram posts.